Fame at last. Sidepodcast has mentioned a post of mine in their latest podcast. Now I just need to work on the fortune bit. Joking aside, the podcast is their usual excellent round-up of the week's news with commentary and discussion - well worth a listen. 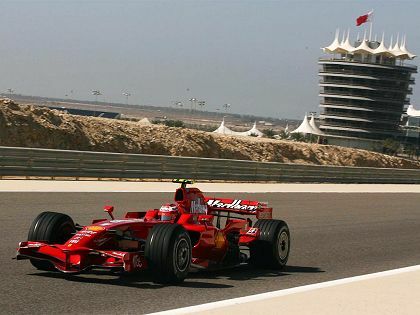 I was particularly interested in what Christine and "me" had to say about the Ferrari's speed in testing in Bahrain. They are the first to suggest that this might be deliberately designed to frighten the competition, a sort of reverse sand-bagging. That is always possible, of course, although I think such a strategy runs the risk of spurring other teams to greater efforts that could result in considerable improvement in their speed. But it was good to hear that some commentators are not running scared of Ferrari's apparent advantage; the general opinion so far is that even McLaren will struggle to stay with the Italian team this season. Personally, I think the F2008 is as fast as it appears but I am not so sure that this will last once the season begins. On the final day, Toyota got their act sufficiently together to be within half a second of the Ferraris, giving hope that the gap is not insurmountable. The Italian team also had a couple of failures (an oil leak and an engine problem) during the test, suggesting that reliability might still be their Achilles heel. Meanwhile, the other teams are improving as well. At Jerez today, the McLarens were quickest with the usual culprits lining up behind them. Kubica and Heidfeld had the BMWs amongst the front runners and Piquet Jr. underlined Renault's improvement by splitting the pair. Just ahead of him, however, was the Williams of Nakajima. Yes, I said Nakajima - Rosberg was half a second slower. This is beginning to be the pattern when Williams go testing and must show that, even if Kazuki is running with a lighter fuel load than his team mate, he is not a sop to Toyota but genuinely deserves to be in F1. Let others remember him for his pit stop mistake in Brazil last year - I will recall that he also set a faster race lap than Rosberg on that day. Looking at testing so far, one would have to say that it appears that we are in for another two-horse race in 2008 - Ferrari and McLaren still look the most convincing of the bunch. The battle for third fastest team is anyone's guess, however. BMW are recovering from their poor start, Renault seem to have put their poor 2007 season behind them and Williams are definitely in the frame. Toyota are difficult to assess but should be in there somewhere too. The disappointments are Red Bull and Honda, neither team making much progress from their poor starts this year. At the back, Toro Rosso have re-occupied their expected position as best of the no-hopers and Super Aguri and Force India battle for last position. I'll stick my neck out on this one and predict that Force India will improve sufficiently to leave SA as the weakest team on the grid. Money does make a difference, even if it can't buy race wins. I have to hope that Ferrari are not as dominant as some expect and that McLaren are not the only team capable of challenging them. It really is time that we had a season of several different teams and drivers winning races. And what a pleasant change it would make to see some unfamiliar faces on the top step of the podium. "suggesting that reliability might still be their Achilles heel"
remember when they threw massa's tyres all over the pitlane last year? wouldn't have happened if brawn was still around. same with that windtunnel 'failure'. they're going to miss him badly this year, and i believe the reliability will only get worse and worse. One of the reasons I am an F1 fan is the soap opera. I was actually introduced to F1 by my mother, who is Austrian, and told me the story of Nicki Lauda. When he returned to racing from his first retirement, I tuned in and got to know Prost, Mansell, then Senna et all. I got into it because of a story, and the stories keep me, and it has to be said that off-season testing is a huge part of the soap-opera. Once the silly season-the bigger story arc-has settled, the car question comes into play, and we start to get a glimpse of what is to come. But it really ends up being a fools game in trying to nail down any definitive predictions. At the end of the day, we just don't know what is really going on, but isn't it fun to speculate? Some clues: the man is quick although he's been around for a while. And everyone says he can't win because he sports a beard! Quite right, Becken, Stepney was Michael Schumacher's chief mechanic and was widely credited with Ferrari's reliability at the time. I think that probably plays a part in their reliability problems of late but the break up of the whole team can't have helped either. Ironic it certainly is. Ah, so THIS is going to be his year! I'm afraid if he couldn't do it in his prime in a Newey McLaren, he won't do it in his senior years in Newey Red Bull. Still, we have to have favourites. Being Canadian, I was a Villeneuve fan, and look where that got me! Oops, wrong beard! Forgot about Heidfur! Still, I don't think he has what it takes to run with the top 3, but we just won't know until they give him the car he needs. I would like to see Rosberg in a top car. He certainly has Wurz's endorsement, and if not a race winner, Wurz has an eye for technical and techique. I agree that Rosberg is an excellent prospect. There is an outside chance of him winning races this year as the new Williams looks very good. I wondered about Wurz saying that Nico is the best qualifier in F1, however. It's just possible that Alex would like to think so because it makes his poor qualifying last year a bit easier to understand. I have a feeling about Bourdais, Arun - I think he's going to be good. And that means good enough to beat Vettel, who everyone thinks is the greatest thing since sliced bread, for some unknown reason. Personally, I've seen nothing to justify all the expectations heaped on Vettel's shoulders.